I could not resist after the last TBBT episode to make something of it. I know her wedding dress is not really good, but I hope it looks like a wedding dress. I hope you like it a little. 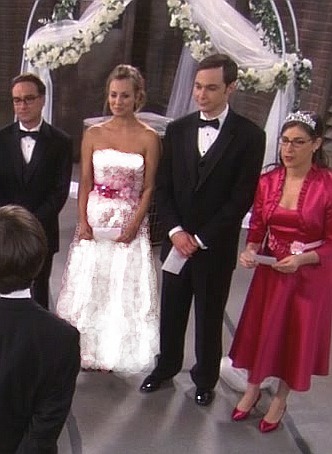 Wow, I didn't notice it before, but if you just looked at this picture and didn't know anything about what was actually going on in this scene, you could mistake Sheldon and Penny for the ones getting married! I wonder if the writers did that on purpose just to tease the Penny/Sheldon shippers lol. Hahaha, I didn't even realize that you had colored the picture! I thought that white dress was what she was originally wearing. When I first looked at it I thought it was really weird that the writers wanted her to wear that dress. I thought it might be a sign. That is good. ;D *lol* No, sadly did she not wear a white dress. *sniffle sniffle* ;) Her dress colour was like Amy's. ohhh we have wedding pictures! These are fantastic. As soon as I saw the setup of this scene I freaked out that Penny and Sheldon where beside each other and looked like they were getting married ^_____^ My heart is never far from my ship :P Awesome icons and pics!! !